I'm not ashamed to say I'm a total Sci-Fi fan - I adore Stargate, love BSG (Battlestar Galactica to the uninitiated) and live for Lost, so when the last ever series of Battlestar Galactica drew to a close a couple of weeks ago it was a bit of a trauma! No more weekly fix of cylons, Leoben Conoy (is it just me that remembers Callum Keith Rennie in Due South?) and maybe most importantly, no more Jamie Bamber on our screens (Apollo). But imagine my surprise when I spotted a trailer for UK Law and Order featuring the very same Mr Bamber! Of course the series has been on for weeks already so I trotted over to the ITV site hoping they have a watch again feature and lo and behold they do! Tuning in, it was slightly disconcerting to start with to hear Jamie chatting away in a Kosha London accent! Turns out that it's not a London accent that he does really well, it the US accent! He actually born and bred in Hammersmith ('ammersmiff' if you prefer!). Shocker! In another weird Sci-Fi connection one of the lawers is none other than Freema Agyeman - Martha Jones from Doctor Who... it's a small world! So of course after one episode I'm hooked and now face a mammoth, eye-bleeding 6 episodes watching on the laptop before I catch up and can return to the 'proper' TV broadcast! 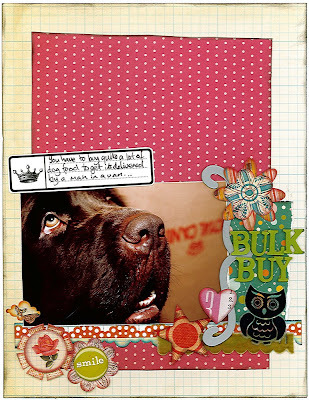 A little page to share today using the March Studio Calico kit - I love this one, especially all the scrummy new Sassafras bits and pieces. The picture is Martha (of course) with the backdrop of one of the huge boxes that the dog food gets delivered in. I always feel sorry for the poor courier driver as he struggles up the path lugging these 20K monsters! Hope you soon fel better...think everyone is getting something at the mo!